UConn point guard Alterique Gilbert, who injured his shoulder in the team’s win over Wichita State Saturday night, did not practice earlier this week. A UConn spokesman said Monday that Gilbert had X-rays done on his left shoulder, though he did not reveal the results of the exam. Gilbert’s condition “is being evaluated by our medical staff,” according to the spokesman. Gilbert collided with Wichita’s Morris Udeze while the latter was setting a screen early in the second half of the Huskies’ 80-60 win. As Gilbert lay on the ground in pain, coach Dan Hurley and trainer James Doran immediately went onto the court to check on his condition. As Gilbert has missed nearly all of the last two seasons with shoulder injuries, many in the crowd as well as some of the Huskies were very concerned. 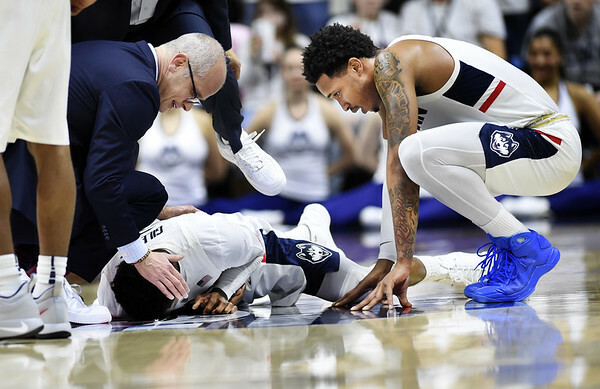 “That wasn’t the best sight but knowing what ’Rique has been through, we knew he wasn’t going to stay down,” UConn guard Christian Vital said. Indeed, Gilbert did walk off and tried to show he wasn’t in much pain. Hurley said after the game that the injury “wasn’t a long-term thing,” though the coach wasn’t sure Gilbert would be ready to play in the Huskies’ next game against the Knights. Gilbert is the Huskies’ third-leading scorer, averaging 13.0 points, 3.8 assists and 3.0 rebounds while playing an average of 29.2 minutes a game. UConn (12-8, 3-4 American) will be in Orlando Thursday for a game against Central Florida (15-4, 5-2), the preseason AAC favorite. Posted in Newington Town Crier, UConn on Tuesday, 29 January 2019 21:25. Updated: Tuesday, 29 January 2019 21:27.